I always encourage couples to bring something special with them to their engagement shoot. This helps to give the photos more authenticity and to make the shoot unique to the couple. Brandon and Natalie brought this antique car; other couples bring dogs or bicycles or just meaningful outfits and accessories. Making your engagement shoot your own is so important because the photos that you will treasure of you and your partner will be those that truly reflect who you are together. If you feel inauthentic or like a poser when you look at your engagement photos, you will think they were a waste of time. Even if you're very critical of photos that you're in, an engagement shoot allows you the opportunity to try a bunch of different angles (with a professional photographer!) and locations to figure out what you like best. 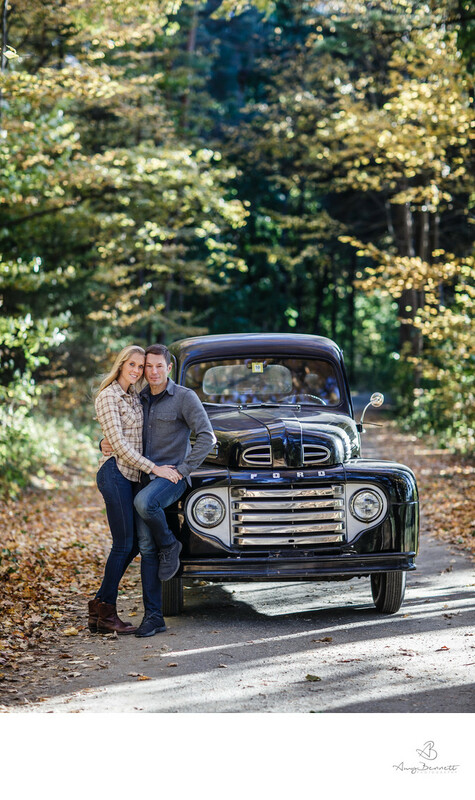 And if that's not enough to convince you, maybe the idea of finally getting a great picture of you and your car will be the thing that makes you want to take engagement photos. Whatever gets you there, I'm here for it. Are you intimidated by the idea of doing an engagement shoot? Well-posed photos of engaged couples can add to this intimidation and make "regular" couples feel inadequate or embarrassed about having their photo taken. I loved taking these photos of Brandon and Natalie because Brandon is an old friend of mine and because they were complete naturals at coming up with poses for couple's photos. Their comfort in front of the camera made their photos effortlessly gorgeous (not to mention the fact that they are an effortlessly gorgeous couple). Not everyone is as comfortable in front of the camera as these two are, but that doesn't mean that everyone can't have perfect engagement photos to use for their save-the-dates and to mark this important time in their relationship. I try to keep my wedding photography portfolio reflective of all of the couples that I work with--those who would be just as comfortable walking the runway as they would be in front of the camera and those who frowned in all of their school pictures growing up and don't post selfies on Instagram. Regardless of your comfort with the camera going in to your engagement shoot, my goal is to showcase your love and connection and ultimately to make my clients realize that getting their pictures taken is not a big deal--the only thing that would be a big deal would be not getting these pictures taken at all. Location: Shelburne Farms 1611 Harbor Rd, Shelburne, VT 05482.